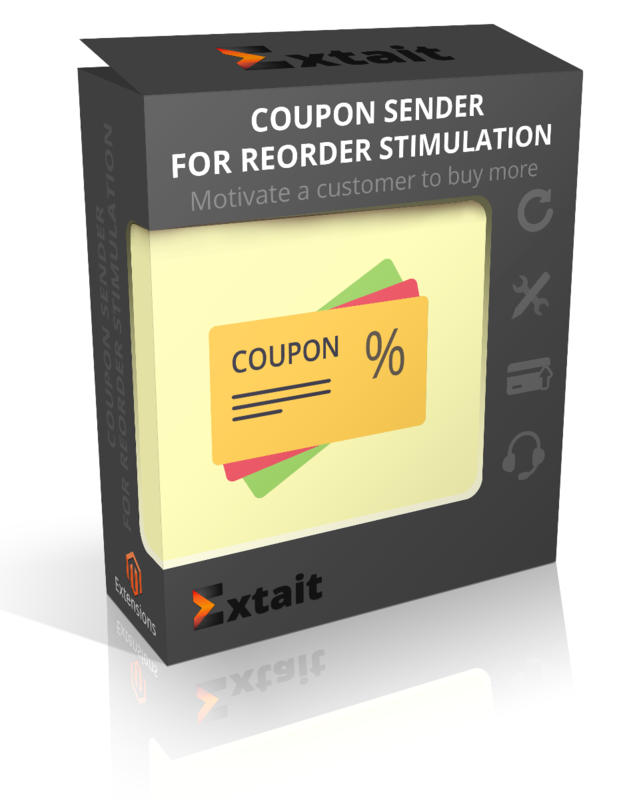 Recover one-time buyers with automatically sent discount coupons. Automatically generate and send discount coupons. Specify who gets coupons (e.g subscribers only). Choose how your customers get a coupon code (via email or pop-up). Adjust the discount rate, coupon lifetime, and notification period. Create a coupon section in customer account. Effective tool to nurture customer loyalty. A customer makes a one-time purchase at your store and then disappears? Don’t count on product-specific discounts to recover him - each irrelevant one raises your chances to get unsubscribed and lose him forever. Better try offering a general discount that a customer may apply to the entire cart. Coupon reminder will track all your clients who haven’t bought anything from you within a specified timeframe and automatically will send them discount coupons. You only need to adjust settings and prepare yourself for more orders. Coupon reminder tracks your customers buying frequency and automatically sends discount coupons to those who haven’t purchased anything from you over a long period of time, e.g. 90 days. Discount coupons prompt your customers to visit your e-store and stimulate them to make purchases. You may send a coupon directly via e-mail or display it as a pop-up once a customer visits your store. All settings are highly customizable including the amount of discount, notification period, coupon lifetime and more. Thus you may easily create and send either ordinary 5% discounts to inactive clients or mass 20% seasonal discounts to your entire customer base. Coupons are stored in the customer’s account and applied to the entire cart. With the help of the extension, you can easily send coupons to customers. After a certain period from the last purchase, registered customers see that a special discount was given to them. It’s a nice offer that they can hardly resist taking advantage of it. By this, you get the potential to increase sales. Adjust your coupons according to your product type. Choose the amount of discount, notification period, coupon lifetime, the number to generate and the way it’s shown to customers. All that is helpful to make your customer retention strategy tailored to your product type and business. To be sure that customers don’t miss your offer, you can adlust settings to show coupons in the form of popups. When a customer signs in, a coupon appears in the account. Set how often to display this popup: once, periodically, or every time after logging in. Also, you can enter your short message to the popup. Beside popups, you can send emails to notify of new discounts. In the email there is a coupon code to apply to a shopping cart. A customer can use it even after you disable the extension. To make notification process easier you can use a template with the subject and the text of the coupon message. Enabling the extension, you have a separate section in admin panel to handle all existing coupons. Rule name, coupon code, lifetime and status are displayed on the grid. All applied coupons are removed from there. Such section is very useful to monitor the current status of your discounts. To better target your offer, you can choose who will get a discount coupon: all customers or only newsletter subscribers. Having completed all the settings, select stores for coupon sending. Moreover, one generating rule can be applied for several store at once.